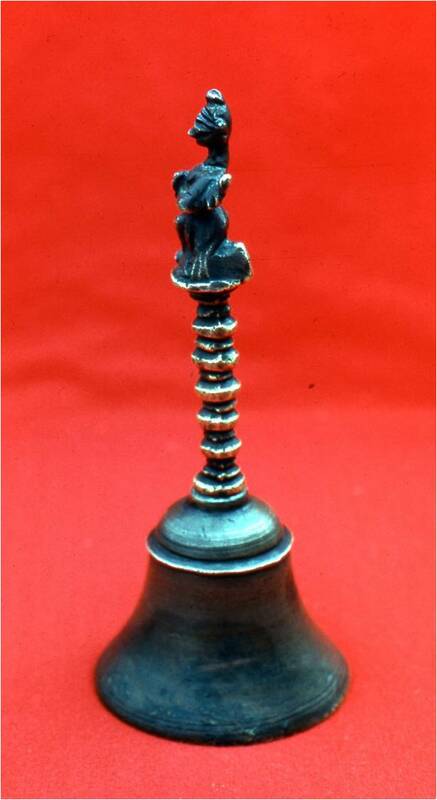 Mr. Newton Anderson found this bell inside of a lump of coal in 1944. The coal was from a mine near his home in West Virginia. The lump was dropped and it broke. Newton found the bell encased inside. The significance of this is so great your life's eternal destiny may be weighing in the balance. Read on. The image on the top bears a striking resemblance to a demon worshiped by the Babylonians. They both have wings, pronounced facial marks and an ibex horn on the head. I know what you're thinking. "O.K., what is the purpose of this?" Would you just stop and think with me for a moment? 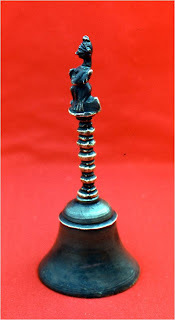 Here is a bell made of brass with an iron clapper found in a lump of coal that is supposedly "300 million years old." None of this fits present theories. A nuclear activation analysis test done at the University of Oklahoma revealed that the Anderson Bell contained a strange combination of brass that did not fit any known metal mixtures or workings. Genesis 4:22 says Tubal-Cain was "an instructor of every artificer in brass and iron..." This civilization had an abrupt ending in a universal colossal flood described in Genesis chapter seven. (This is not an isolated artifact. Many such artifacts have been found.) *This artifact was encased in vegetation that was buried and eventually formed into coal. Thousands of years later it ended up in the coal bin of Newton Anderson's father. The Bible is the Word of God. Jesus said in Matthew 5:18 "for verily I say unto you, Till heaven and earth pass, one jot or one title shall in no wise pass from the law, till all be fulfilled." Not the smallest portion of the Bible is false and all the Scripture will be fulfilled in its entirety. Some day everyone will stand before God in judgment. One of the exciting joys of the Bible is the crystal clear fact that on the day of your judgment you can stand before God without condemnation. You will not have to give account for your sins, because of what Christ did for you. God loves you -- will you give him a few more minutes of your time and read on? The way to heaven is not what you may think. This Scripture is talking about Jesus Christ the Son of God. It shows us that a person either has Christ and eternal life or does not have Christ and eternal life. It's not some goody goody thing. You see -- eternal life is in Christ. It's not something you can work for or produce in your life through your own efforts. Going to heaven is -- are you ready? -- totally, completely, and entirely a gracious gift of God. This is why your religion may not be helping you. You may be obeying all the rules that your religion gives you, but that will not produce eternal life or bring joy into your life. Most of my frustrations as a boy growing up came as a result of my religion. The only way you can have eternal life and the joy that accompanies it is to have Christ. 1) The Bible says, "For all have sinned, and come short of the glory of God." (Romans 3:23) That means that you and I are sinners and we need to admit that to God. 2) The Bible says, "For the wages of sin is death..." (Romans 6:23a) God's Word says that we receive the wages, death, because of our sin. This is physical, spiritual and eternal separation from God. 3) "...but the gift of God is eternal life through Jesus Christ our Lord." (Romans 6:23b) Look at this! God is offering us the Gift of Eternal Life. God can do this because Christ suffered the wages and punishment, DEATH. We would all have to die and be eternally separated from God. "But God commendeth his love toward us, in that while we were yet sinners, Christ died for us." (Romans 5:8) Christ paid the debt. God's holy and unchanging character demands that your sin be punished. Christ satisfied God's holy demand by taking the punishment for every one of your sins. Will you believe in your heart that he died for you? Let's suppose you get a $500.00 traffic ticket, but don't have a dime to pay the fine. A friend finds out and goes to court with you. The judge after hearing testimony says, "That will be $500.00, please." Your friend steps up, pulls out his wallet, and says, "I'll pay your debt." At this point you have a choice. You can let him pay it by receiving his gift or you'll have to pay it, which means that you will go to jail. God is eternal. If you pay your own sin debt it means punishment forever for every sin. If you receive Christ's payment, you are forgiven and free. How do you receive God's payment? 4) The Biblical demand is "...repentance toward God, and faith toward our Lord Jesus Christ." (Acts 20:21) This demand is more than just asking god for forgiveness. Many people have asked God to forgive them for sins numerous times yet they have never experienced a change in their lives. "Lord Jesus, I ask that you forgive me for sinning. I don't want to sin anymore. Come into my heart and be my Savior and my Lord. Thank you for dying on the cross for my sins." If you have made this decision for Christ, write and tell me. In the 1980's Dr. Roy Mackal, Chicago Professor of Biology, organized two expeditions to attempt to find a live African dinosaur. This was motivated by the rumors and eyewitness accounts of African natives to the existence of such Animals. I have known of the expeditions for many years and mentioned a similar expedition in the first edition of my book, Ammunition in 1991. Recently I had the opportunity to meet and interview missionaries Gene and Sandy Thomas. Gene was the interpreter on both of the Roy Mackal expeditions. He and his wife are veteran missionaries of remarkable sacrifice and very rich in experience. Gene preached the gospel while Sandy provided needed medical help for the natives. God had delivered them from cobra bites to being surrounded by overzealous juvenile Communist militia soldiers with machine guns, set on taking their lives. Their description of the magnificent manifold abundant Grace of God was exciting. My fervent interest in the creation science field brought me to interview Brother Gene on his participation in Dr. Roy Mackal's two expeditions to find a live African dinosaur. I know that looking for a dinosaur in the 20th century seems unreasonable and unintelligent. The unscriptural propaganda and indoctrination that Satan has brought through the "educational system" in the last 100 years provided fertile ground to reject the idea of dinosaurs in the 20th century. Consider these important points. God created these animals on the sixth day of creation. There are no "millions of years." Noah would have most certainly taken dinosaur kinds aboard the ark. The large number of different dinosaurs today are the product of overzealous "scientists" trying to make a name for themselves. I believe that some of the "small dinosaurs" are nothing more than young dinosaurs that haven't reached adult maturity and would as adults be classified as a known larger "specie". Looking at pictures of these dinosaurs one could reasonably lump them into a smaller number of Genesis kinds. This small number of kinds would be brought aboard the ark. As they dispersed from the ark they would have roamed to their natural habitats directed by God given instincts. The jungles of Africa would provide the climate, and a remnant could have understandably survived. What Did the Expedition Turn Up? 1. Six-month old footprints that could match a dinosaur - The pygmies estimated from their knowledge of tracking animals in the jungle that these tracks were approximately six months old. They were also adamant that the tracks did not belong to hippos or elephants. 3. The testimony of many of the natives to the existence of a number of unusually large and different reptilian animals - These animals have clear characteristics of dinosaurs. When shown pictures of various animals including a sauropod dinosaur, they would point to the dinosaur picture as the unusual animal they have seen. Three of the animals that natives have recognized are named mokele-mbembe, nguma-monene, and mbielu-mbielu-mbielu. Mokele-mbembe means rainbow because of the shape of its long neck in the water. 4. The expedition brought to the public the testimony of missionary Joseph Ellis who in November of 1971 saw an unusual reptilian animal cross the river in front of him. - Joe was in a 30-foot long dugout motoring his way upstream to Mataba to teach the Bible class to the natives. At a place in the river that was about 200 feet wide he saw an animal, which he estimated, was 30 feet long (as long as his dugout) cross the river in front of him. The animal had visible diamond shaped objects down the center of its entire length of its body. It was either swimming or walking on the bottom. (The river bottom was an estimated 15 feet deep.) Most of the animal was submerged and not clearly seen out of the water. 5. On one occasion as the expedition was crossing a lake, a submerging animal created a large wave that could not have been produced by any known African animal. - Although this is not proof of anything, none the less a sauropod submerging would most certainly be able to create such a wave. What Would the Capture of a Dinosaur Prove? For example, the same chemical agent and radiation that supposedly rearranged the DNA that changed the animal into the turtle is still working on the turtle and eventually that animal should be constantly changing into something else. The turtle should not have a perfect counterpart in the 20th century, yet there are 250 living "species" today. Since the turtles, we are told, were fully developed by the supposed time of the dinosaurs, it has had over "225 million" years minimum to change into a "duddltue" etc. And for the sake of argument if mutational change through the environment brought the turtle into existence, what kept it from changing through the 225 supposed million years of time to the present. After all its DNA is being bombarded constantly by the same agents that brought about its original "mutational form." We creationists like to bring up the fact of no transitional forms and rightly so, but in reality if the mutation theory is true, everything should be in transition. No animal should exist over time because it is being constantly bombarded by the same chemicals and radiation that supposedly gave rise to its existence. 4. It would be neat to see a remnant of those magnificent animals that God created for His glory. Let me conclude by saying that I believe very strongly that these animals exist. Supposedly extinct animals are always cropping up. Gene Thomas shared an experience he had aboard an airplane right after his second expedition. On the plane were two professors from major U.S. universities loudly, viciously and openly trying to destroy the reputation of Dr. Roy Mackal and ridicule the expedition. Gene sat for a while and listened and then went back and challenged the men. He said, "I was the interpreter on both expeditions and you don't know what you're talking about." 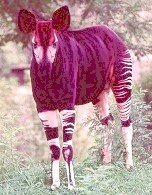 Then Gene challenged them, "Do either of you know of an animal called an OKAPI?" They both said, no. This gusty missionary went on to share that this animal was supposed to be extinct and then some Congo natives showed the skin of one to western scientists who immediately said it was a fake. So the natives went in the jungle and brought a live one out. Today there are a number of these animals in major zoos in the United States. That men have encountered these supposedly extinct dinosaurs throughout history is a matter of fact. In the book of Job, we have the testimony in chapters 40 and 41 of two descriptions of dinosaurs. Job historically appeared between Noah and Moses. He could not have seen this animal if Noah had not taken them aboard the ark. Secondly, dinosaurs have appeared throughout the history of men in legends and written testimony to which even astronomer Carl Sagan admitted. And thirdly, there are testimonies today that these great animals are still alive in the dense jungles of the African Congo. That Westerners have seen such animals is a matter of fact. In my book Ammunition I have the account of Herman Reguster, a California engineer who testified to five sightings of a "35 foot long animal that was very dinosaur-like in appearance." He saw the animal in the same African Congo that we have been talking about. These animals were created to display the wisdom and creative power of God. Brother Gene shared that the wave that hit their dugout was extremely frightening to the natives as they thought of the implications of such a wave. I'm sure these animals before the flood were terrifying. Think of it. If man cannot stand before these animals, how could they stand before the one that created them? Thank God for the blood of Jesus that cleanses us of all unrighteousness and gives us a position in Christ to be able to stand before Him. Have you ever been in a courtroom trial where the lawyer of one side was never allowed to examine or cross-examine the witness? No, you haven't. As prejudiced as our judicial system is at times, both lawyers are always allowed this right. "Professor Lotsoffaith, do you swear to tell the truth, the whole truth, and nothing but the truth, so help you Darwin?" Judge: "Evolutionary Lawyer, you may question the witness." Evolutionary Lawyer: "Professor Lotsoffaith, would you please give this classroom of students evidence for the obvious fact of evolution?" Professor Lotsoffaith: "Surely, that's simple. We biologists know that the geologists have proved the fact of evolution from the fossil record." Evolutionary Lawyer: "No more questions, Your Honor." Creationist Lawyer: "Your Honor, we would like to cross-examine the witness." Judge: "How dare you try such an unscientific thing as that! You have nothing scientific to say and furthermore, one more outbreak like that in this classroom, and we will hold you in contempt of court! "Evolutionary Lawyer, you may proceed." Evolutionary Lawyer: "Your honor, we would like to call as a witness to the stand Professor Circlereasoning, the geologist from Watereddown University. "Professor Circlereasoning, could you tell our class of students what proof we have for the obvious truth of evolution?" Professor Circlereasoning: "Surely, that is simple. As geologists, we know that the biologist has established proof beyond any doubt. He has experiments, Archaeopteryx, arguments for similarity, Eohippus, a dark and a light moth; and furghermore, Richard Goldschmidt, former professor at the University of California said, 'Evolution of the animal and plant world is considered by all those entitled to judgment to be a fact for which no further proof is needed." Evolutionary Lawyer: "No further questioning, Your Honor." Creationist Lawyer: "Your Honor, we would like to put forth our witness." Judge: "Your witness? Didn't you hear what Goldschmidt said? ' by all those entitled to judgment'"
Creationist Lawyer: "But, Your Honor, our witness was the guest scientist at Oak Ridge National Laboratory for nearly 13 years (an unprecedented time for a guest scientist) and one of the world's foremost authorities on polonium halos. His research has proved the instantaneous creation of the earth's granite rock, a fact that denies the earth being a molten state for millions of years." Judge: "It is clearly obvious to this court that you and your witness are trying to impose your religious convictions upon these students, and it is the decision of this court that this classroom shall not be cumbered about by an unnecessary examination that attempts to refute the clear and obvious fact of evolution. This court is adjourned." I am writing this letter as a thank you for your work on the book Ammunition For Piercing the Armor of the Philosophy of Evolution. Several years ago, you visited my church, first Baptist Church of Beech Grove, as a guest speaker during a conference. I listened to your presentations and found everything you said to be very interesting. At the end of the conference, my mother purchased your book. I did not become more interested in the controversy of creation versus evolution until the spring of my junior year. For an Intermediate Composition class. I had an assignment to write a persuasive research paper. I thought what better a topic than creation. Your book and the Bible were my main sources. As I researched for the paper, I realized that there is so much evidence proving that evolution is wrong. I was especially amazed how evolutionists twist evidence in the world to fit their ideas of evolution. I received an A on the paper and I owe my success to the excellent evidence in your book. This year, as a senior, I must give a persuasive speech. Since my research paper was so successful, I have decided to do my speech on creation. My goal for the speech is to give information to persuade scientists to believe in creation or at least reconsider their stand on evolution. So far, the speech has gone well, and I am very excited about telling my classmates of my strong beliefs in creation. Your book is very well written. As I read each chapter, I found everything clearly explained. Even the most scientific explanations were made easy to understand. Without the information given in your book, I would have found myself searching all over town for a reliable source. I thank God that there are men in this world who are not afraid to stand up for their beliefs. Sometimes in this ungodly world, I find it hard to stand up for Jesus and what I believe in. Once again, thank you for all of your excellent work. I appreciate your dedication to God. 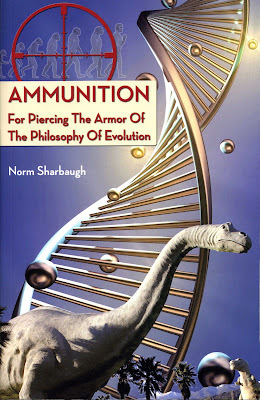 As a science teacher in a Christian high school, Ammunition, by Norm Sharbaugh, has been one of the most helpful books that I have read for preparing high school students to understand the critical issues comparing the theory of Evolution to that of Creation and the Young Earth Theory. In an easy-to-understand manner, Ammunition enables the students in my classes to see new and exciting interpretations of scientific data that are solely based on the principles of God's Word. The ability of this book to empower students in this significant area, has given my students tremendous advantage as they further their education in secular colleges across the nation where only Evolution is taught, and erroneously taught as fact. Ammunition is exactly what our Christian young people need as they battle evolutionary teaching throughout their educational experiences. Dee Tidball is a veteran teacher of 19 years. She teaches biology, advanced biology, chemistry, and physics. I have immensely appreciated your recent book Ammunition For Piercing The Armor Of The Philosophy Of Evolution. God has greatly blessed me by allowing me to hear you speak at the Hazelwood Baptist Church and giving me the opportunity to acquire your book. I find the book to be an excellent presentation of recorded historical fact and a well-reasoned commentary on both the fallacies of evolution and the infallibility of Holy Scripture. I am familiar with no other book which uses the Scriptures more effectively in tackling this challenging subject. This has been especially important to me in grasping the true importance of the current creation /evolution controversies. I share your burden for the youth of our society. As a Ph.D. Mechanical Engineer (Purdue University 1983), I commend your careful handling of the several technical disciplines which have in the past been erroneously proposed as supporting evolutionary theory. Whether you are explaining the clear evidence for the intelligent design of DNA, or the human artifacts discovered in supposedly prehuman rock layers of our earth, your careful compilation of scholarly works provides enough depth to satisfy the reasoning mind, with enough brevity to keep the focus clear. That focus is squarely on both the complete inadequacy of the evolutionary premises and the complete reliability and trustworthiness of the revealed Word of God. Thank you. My prayer is that God may further increase the fruit of your ministry. For more information visit our Creation Briefs page or view/download Ammunition in its entirety by clicking here.